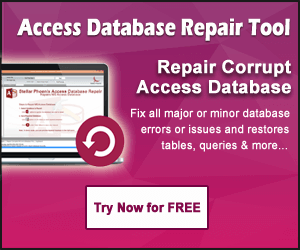 [Resolved] Microsoft Access Error 2554 "Can't find the database you specified"
The complete blog emphasize on resolving of the very common Access Database issue i.e “Can’t find the database you specified, or you didn’t specify a database at all”. So, if you are also frequently encountering with such an error in your Access Database then just go through this complete post. Sometime when you try to open an existing Microsoft Access database using a shortcut, then you may receive the following error message. Can’t find the database you specified, or you didn’t specify a database at all. Specify a valid database name in the command line, and include a path if necessary. Error Description: Can’t find the database you specified, or you didn’t specify a database at all. @Specify a valid database name in the command line, and include a path if necessary.@@1@1@10283@1. What Are The Symptoms Of Encountering MS Access Error 2554? Unusual active program crashes with “Error 2554” appearing. Using other programs and frequent crashes with error 2554. Sluggish operating system and slow response to mouse or keyboard input. Periodical freezes while accessing the database. Error “Can’t find the database you specified, or you didn’t specify a database at all” displayed on the screen. Error 2554 messages can appear during program installation, start-up or shutdown, or even during linking with the database. Also, knowing the proper occurrence instance of error 2554 is essential as it might help in troubleshooting the problem more effectively. What Are The Causes Of Access Can’t Find The Database You Specified Error? Shortcut points to the earlier version of the access runtime application and you choose to upgrade the earlier office programs during the setup of a later version of MS Office. The antivirus software was already getting installed when you installed office Access 2007 or Microsoft Office Access 2003. Incomplete or corrupt download of Microsoft Access Software. Changes in the windows registry from recent database update can change .accdb Database Files. Windows system files or Microsoft Access related program files corrupted due to virus or malware infection. MS Access related files deleted accidently. Error 2554 can be caused by a variety of factors, so it becomes to troubleshoot each of the causes so that effective recovery can be possible. 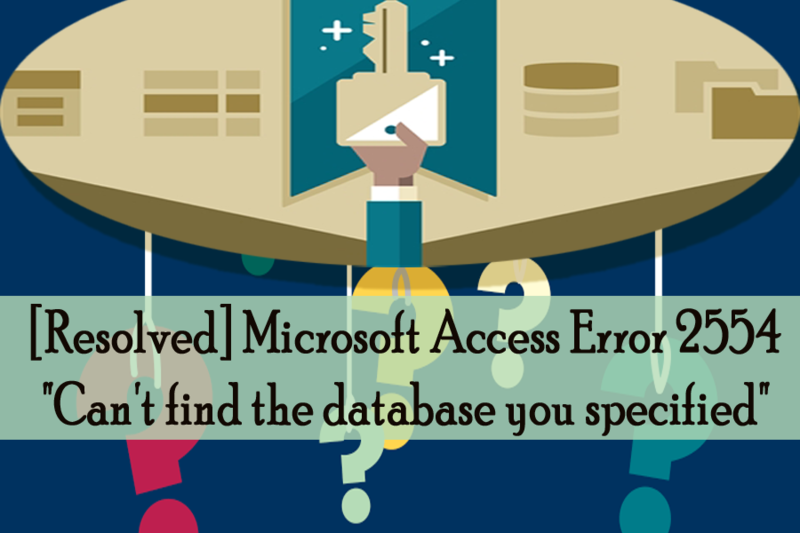 In this section you will get to know about the different methods to resolve the ms access “Can’t Find The Database You Specified, Or You Didn’t Specify A Database At All” error. Well, fixing this issue with Windows registry is not recommended unless you are PC service professional. One wrong step or some unknown changes made in the registry can stop your PC from functioning and create irreversible damage to your operating system. Before manually repairing your Windows registry, first, create a backup and export a portion of registry related to error 2554. Now navigate to error-2554 related keys (example – Microsoft access) you want to backup. In Save Inlist, select the folder where you want to keep registry backup keys and give a file name (Example – Microsoft Access Backup). Click Save, and it will be saved with a .reg file extension. With the usage of the system and web surfing, the computer accumulates junk files which must be occasionally cleaned out, else it causes Microsoft Access to respond slow or at times provides this Access Error 2554, possibly due to overload hard drive or file conflicts. Disk Cleanupwill automatically show how much disk space can be free. Most disk space is occupied by the temporary files. Error 2554 “Can’t find the database you specified, or you didn’t specify a database at all” can be related to outdated or corrupt drivers. Updating drivers regularly provide more accuracy in keeping your system perform better. It might be difficult to find out which driver is actually causing this error, so update all those drivers which might not have been done all in the while. With updated drivers, there’s always a possibility of improvement in the working of your applications. If error 2554 still persists then either your runtime errors may be hardware related or it might not be able to fix with this normal troubleshooting. MS Access Repair n recovery helps when normal troubleshooting doesn’t and it will restore all the data. 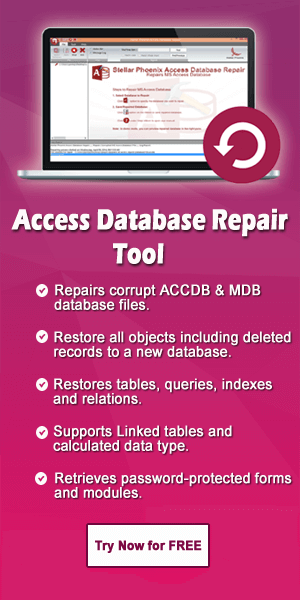 This software is a complete solution to fix the corruption issue in your Access Database. It can fix issues from any of the given scenarios due to hardware failures, software conflicts, and conflicts in database design. Hopefully the above mentioned manual fixes help you in resolving “can’t find the database you specified” error. But if in case it won’t then also need not to get worried for it. As the last method contain such solution when rest of the fixes fails to work.